A tax code is used by an employer or pension provider to calculate the amount of tax to deduct from an employee's pay or pension. If an employee has the wrong tax code this could result in them paying too much or too little tax. A tax code is worked out by HM Revenue and Customs (HMRC), who sends it to the relevant employer or pension provider. A tax code is usually made up of several numbers and a letter, for example: 1185L or K497. If you multiply the number in your tax code by £10 plus £9, you'll get the approximate total amount of income you can earn in a year before paying tax. 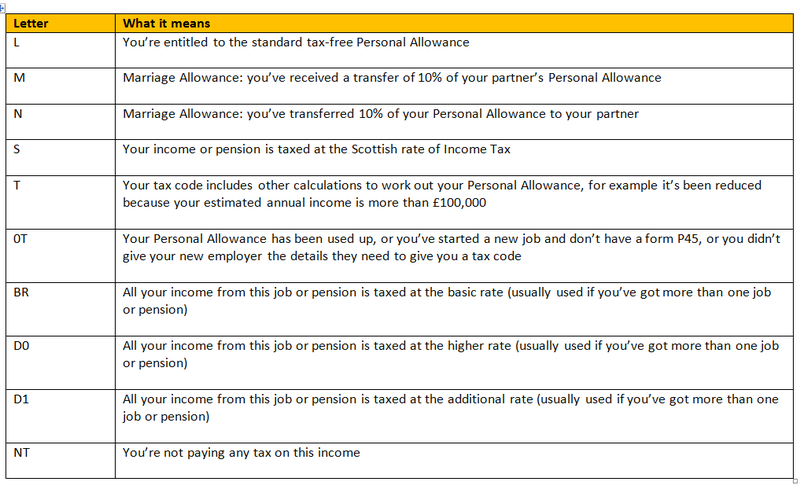 The letter shows how the number should be adjusted following any changes to allowances announced by the Chancellor - common tax code letters are explained below. Income you've not paid tax on (for example untaxed interest or part-time earnings) and any taxable employment benefits are added up. The total amount of income you've not paid any tax on (called 'deductions') is taken away from the total amount of tax allowances. The amount you are left with is the total of tax-free income you are allowed in a tax year. Broadly speaking, to arrive at your tax code the amount of tax-free income you are left with is divided by 10 and added to the letter which fits your circumstances. The tax code spreads your tax-free amount equally over the year so that you get about the same take-home pay or pension each week or month. If your deductions (untaxed income on which tax is still due) are more than your allowances you'll be given a K code, to ensure you pay tax on the excess. Whereas with other tax codes the number indicates the amount of income you can have tax-free, the number in a K code multiplied by ten broadly indicates how much must be added to your taxable income to take account of the excess untaxed income you received. W1 (week 1) and M1 (month 1) means your tax is based only on what you are paid in the current pay period, and not the whole year. These codes are sometimes known as ‘non-cumulative’ and are mainly used as emergency tax codes. If you get income from more than one employer or pension provider, each will usually use a different tax code.